Da Nang to Hoi An City : 35 Km. 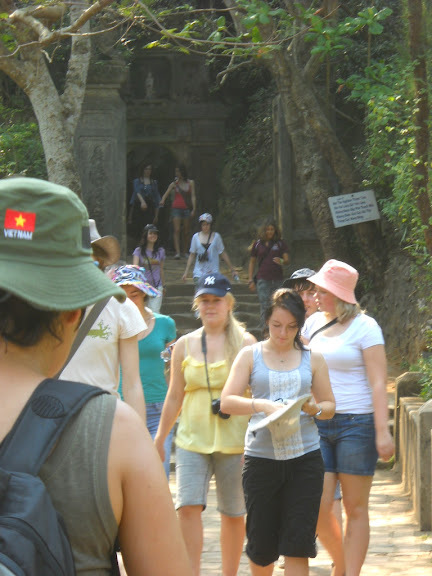 58 $USD= 1.300.000VND for a group of 5-10pax by private 16-seat Van. Not including: Tour guide,drinks,and Lunch. The first stop for you is Hai Van Pass -the high : 500m from the sea level,it is very nice to see the clouds,the ocean & sky from Hai Van Pass.Stop for 20 minutes to see & take the photos here.Many tourists come to see it from Hue city. The second stop is Cham Museum ,you can see many sand-stone statues & carvings which were carved by the champa people.The Cham Museum was built in 1931 by the french people.The Champa culture was very special & famous(2nd century -15th century). The third stop is Marble mountain ,there are five small mounts around on the ground of the delta in Da Nang city.Here you can witness the local people carving the marble in the marble village.Its name is Hoa Hai marble village.After you visit the marble village ,you go to the mountain & can see 3 beautiful marble caves:Tan Chon cave,Huyen Khong cave,Hoa nghiem cave, and 2 pagodas : Linh Ung pagoda,& Tam Thai Pagoda.Near the Tam Thai pagoda,there is a very high mount with some stairs where you can walk & go to the top for seeing 05 small mountain around the delta of Da nang city. After that,you go straight to your hotel in Hoi an city by car and finish your trip there.